Unfortunately, the Music app doesn't support WAV or FLAC playback. There are no equalizer options either. 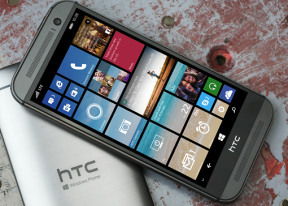 There's an FM radio with RDS support on board the HTC One (M8) for Windows. You can use the loudspeaker for the FM radio, though you still need the headset connected as it doubles as an antenna. The HTC One (M8) for Windows was yet another stellar performer in our audio quality test delivered by the Taiwanese manufacturer. When connected to an active external amplifier, the WP-powered handset managed excellent scores top to bottom with no weak points to its performance whatsoever. 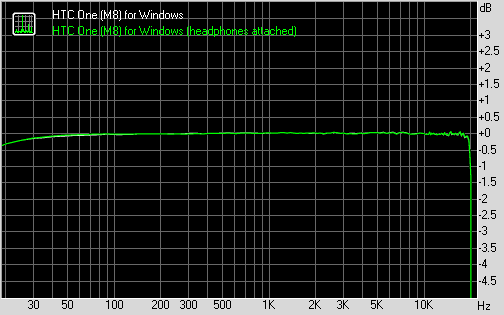 Even better, the degradation when we plugged in a pair of headphones was so minor that we would have considered the scores great even if that was a no-headphones test. The very minor increase in stereo crosstalk means the smartphone can handle large powerful headphones with ease, still delivering some of the cleanest output in business. Once again HTC shows that as far as audio quality is concerned there's no match for it in the smartphone game - no matter if the name is Windows Phone or Android.